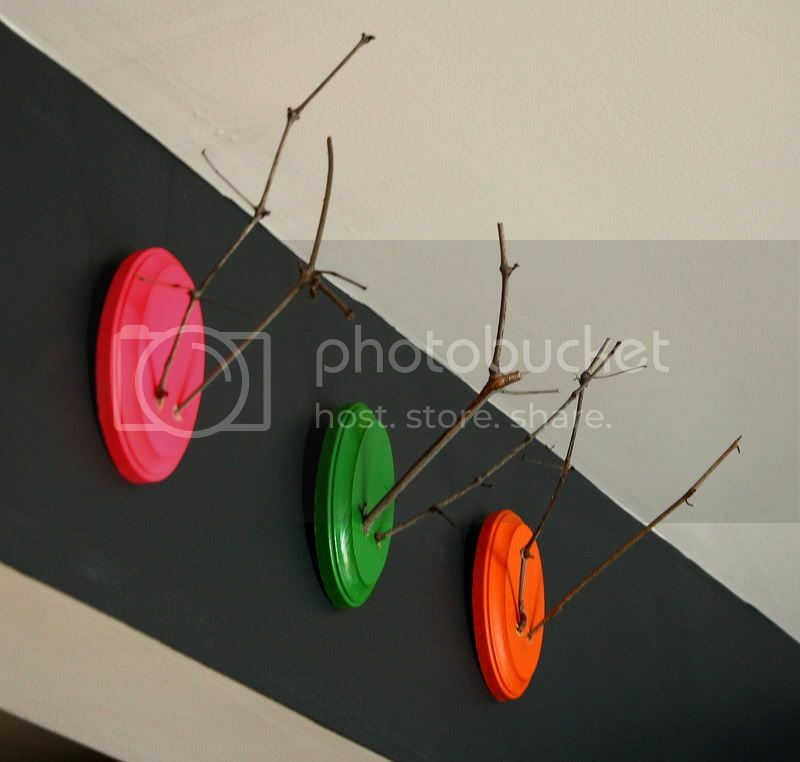 Soooo, the whole faux-mounted-antler trend may be at LEAST 5 years old, but I'm still kinda lovin' it...especially when the "antlers" are "mounted" on neon racks and are miniature. Then, I used a small drill bit to drill in little holes where the "antlers" (aka sticks that I found in the yard, and cut to be all about 7" long) would go. I didn't drill all the way through, just about 1/4" deep. I just eye-balled the centers...I didn't care if they were perfect, and I actually think that its kind of cute for them to be a little imperfect. To make my sticks stay in the holes, I did a little dot of hot glue into the holes. Not too much, or you'll have a big hot glue blob on there. Just a little, then rub it in with your fingers to blend it. They are great. 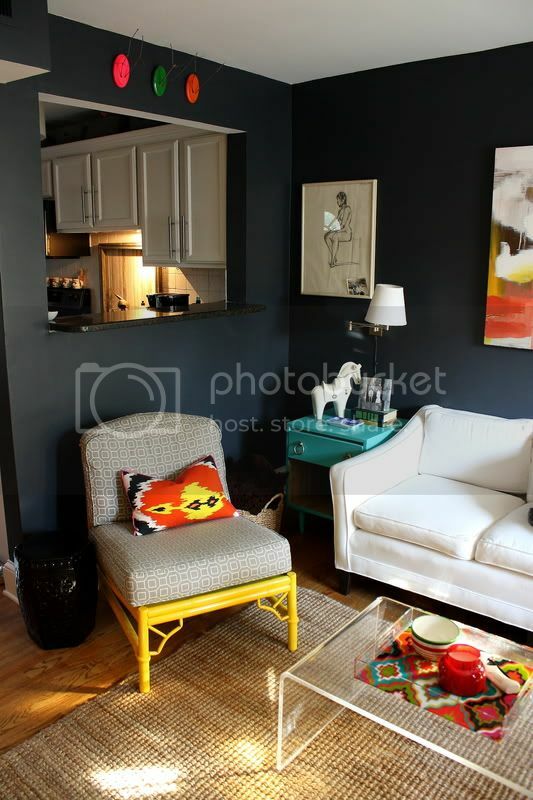 Love the bright colors and your fab yellow chair. 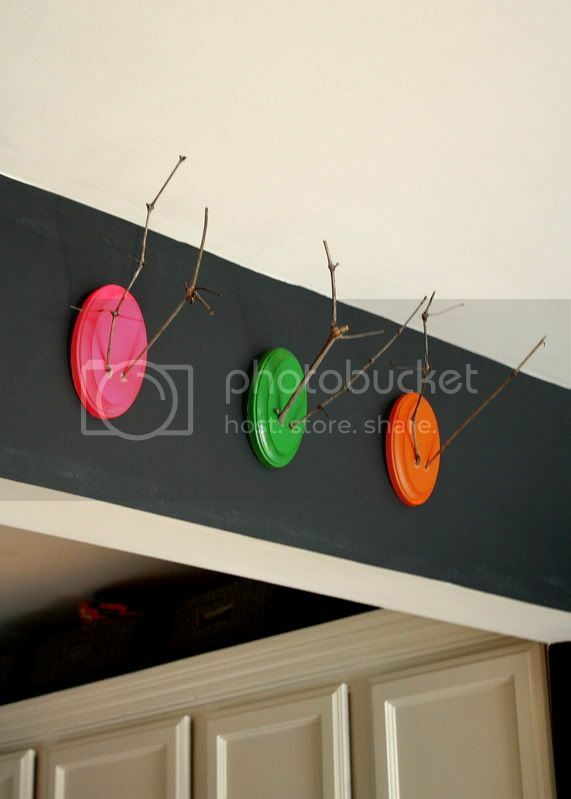 Great idea, the bright colors are fabulous! Off topic..but I love your jute rug. How is it with your cats? Do they scratch it, or is it a fur magnet? I have two cats myself and was just wondering. shana - thank you! our cat doesn't mess with it at all..it's actually kind of soft, so i'm not sure that he ever wants to scratch it. either way, he doesn't mess with it! also, i have never noticed cat hair on it...but i vaccuum it pretty regularly. I love this project! They are festive but can be kept up all year long- so cute! Morrocan Stencil Tone on Tone. Neon pink Christmas in the studio..